When you download and install Google Chrome on Windows 7, the installer option automatically sets it as the default browser - unless you unchecked that checkbox. But Chrome will still run a check whenever it starts: it if isn't the current default, you will see a "Google Chrome isn't your default browser" notice (pictured right). Click "Set as default" to, well, make it the default. If you ever click "Don't ask again", that startup check/notice will no longer happen. If Chrome isn't your current default browser but you still didn't see that notice, it means that you clicked "Don't ask again" at some point. Unlike other browsers, Chrome doesn't have a setting for that notice. But don't worry: Google ensured that it will come back by itself. That will happen if you set once again Chrome as default and another web browser takes over the default later on. 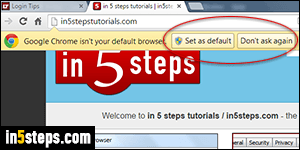 To set Chrome as default browser through the program's options, click on the menu button (top right corner) and choose "Settings". Type "default" in the search box, to quickly filter your settings. 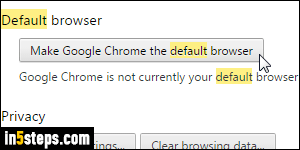 Under Default browser, click on the "Make Google Chrome the default browser" button. If you don't see that button, and instead see a "The default browser is currently Google Chrome" notice, there's nothing left to do. Either way, can close the Settings tab. If going through the app's options didn't work, you can always go through the Windows Control Panel to set the Windows 7 default browser. 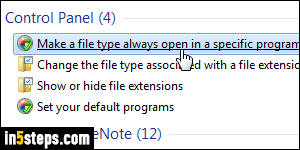 To make Chrome launch specific types of web files (regardless of your default browser), open the start menu and type "file type". Click "Make a file type always open in a specific program". Then, select the file extension to change, click on the Change program button, and choose Chrome - and keep going. Bonus Tip: here's how you set Chrome as default browser in older versions of Mac OS X: launch Safari (yes, it's ironic, and perhaps don on purpose :), and hit Cmd+, or go to Safari > Preferences to pick a browser. 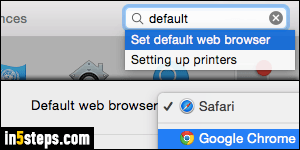 In recent versions of OS X, Apple moved that setting to the System Preferences: type "default" in the search box and select "Set default web browser" (General settings). In the middle of that tab, pick Google Chrome from the dropdown menu.